Today, power is very unpredictable. With so much of importance given to the importance of energy saving and the different ways in which we can use the energy that is available to us, UPS comes as a great source of hope. In some events, the loss of power could cause major damages like in the case of a data center, where the loss of power even for a few minutes could lead to loss of valuable data. In case of a healthcare unit, the loss of power could even prove fatal. The solution lies in not just a surge protector, but an uninterrupted power supply that could protect your systems and minimize the effects of power problems in your organization. Here are the top five tips recommended by UPS manufacturing companies in Chennai to help you buy the right UPS for your device. Just like that of the surge protector, a UPS also has only as many outlets as needed. This is why it is critical to identify the number of power outlets that you will need even before you start searching for one. If you decide and buy a UPS without considering this fact, you will be shelling a lot of money to make the modifications, sometimes even more than what you would have spent buying one with those facilities. Hence, it is advisable to buy a UPS that has a provision to accommodate two more than what is required, so that it gives you some leeway for future additions. The amount of power that you need is also an important factor to keep in mind when you are buying an uninterrupted power supply for your organization. If the devices need more power than the amount of power that can be generated by the UPS, then there is no point in buying such a power backup solution. You can easily find out the power needs of your devices using a wattmeter, which can be purchased easily from online shops. For desktops, you need to consider the wattage of both the monitor and CPU. Once both the number of outlets and amount of power is decided, you need to be sure of how long you will need this power backup. The time duration is also a critical aspect when deciding to buy a UPS. The UPS is designed in different capacities, each of which has a different storage capacity for the battery which means that they made to withhold different capacities of power. Only the right UPS can make sure that the correct amount of power is given when there is a dip or surge in the supply. Some UPS are made to supply power for one or more hours whereas some are designed to be able to supply it for hours together maybe even days if the need arises. To identify the duration of power required, add the wattage that would be drawn by all the devices in your organization and refer to the runtime or load graph for these and identify how much power it will need and for how long. 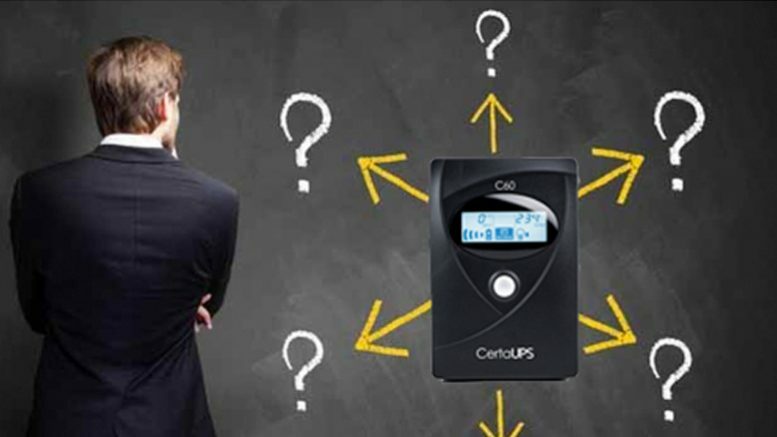 A common myth is that the features of a UPS are quite simple. But in reality, there are a lot of features and options that are available. Even the basic UPS that is used for stand-alone computers can be controlled through a personal computer in order to fine tune the settings. The professional UPS units come with a lot of features like an LED to display the battery charge and/or the runtime in minutes or even the use of swappable batteries. Even though you may not be opting for any of the fancy features, you need to know about it and see if you can leverage any of these for the betterment of your business. The UPS is said to be as good as its internal battery which may have to replaced at least two to three times in the lifetime of the UPS. The warranty for the UPS should cover the battery as well so that you do not have to spend a lot on it later on. Ideally, a warranty period of three years would be good enough, as you can change the battery at least once and don’t have to worry about it for the next two to three years. Many UPS systems are available in the market, some different in every region, so choose the system that works in your office environment, you can even customize if you are not able to find one that fits your needs.